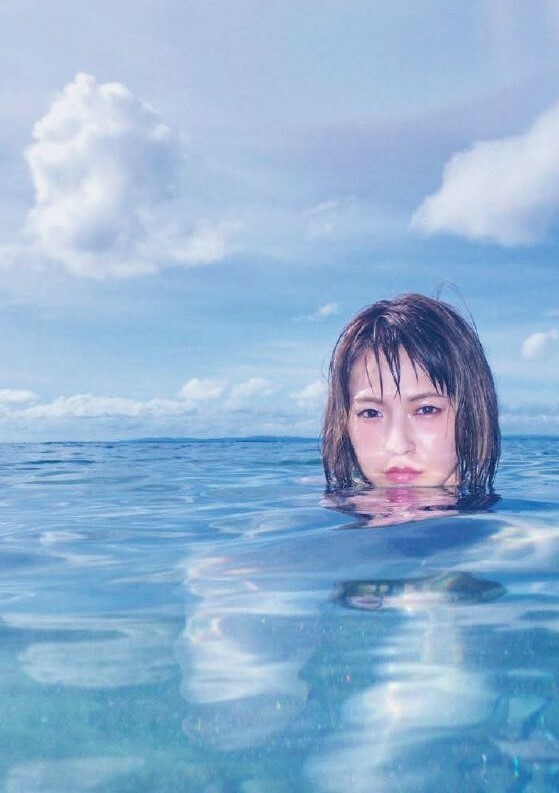 Lead vocalist and guitarist Haruna of all-female Japanese rock band SCANDAL turned 30 on August 10, and on this same day, she released her first ever photo book titled SOMEWHERE. 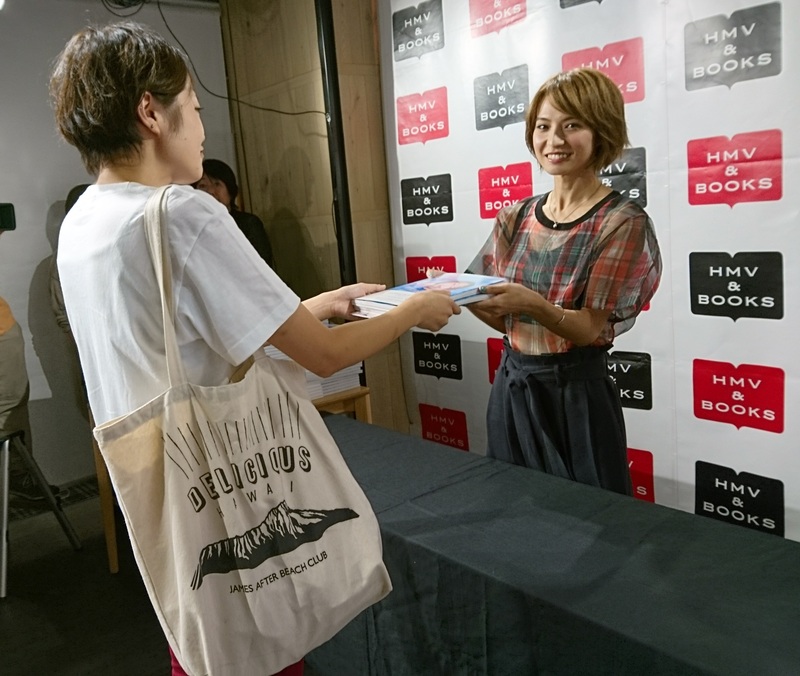 To celebrate and promote the release of the collection, an event was held on August 18 on the 6th floor of HMV&BOOKS in Shibuya, Tokyo which the singer attended in person. Haruna joined SCANDAL in her late teens and has spent her entire twenties as the frontwoman of this immensely and internationally popular rock band. Her photo book, entitled SOMEWHERE, was compiled at the end of the band’s Japan tour. The photos were taken by Japanese photographer Tsutomu Ono. 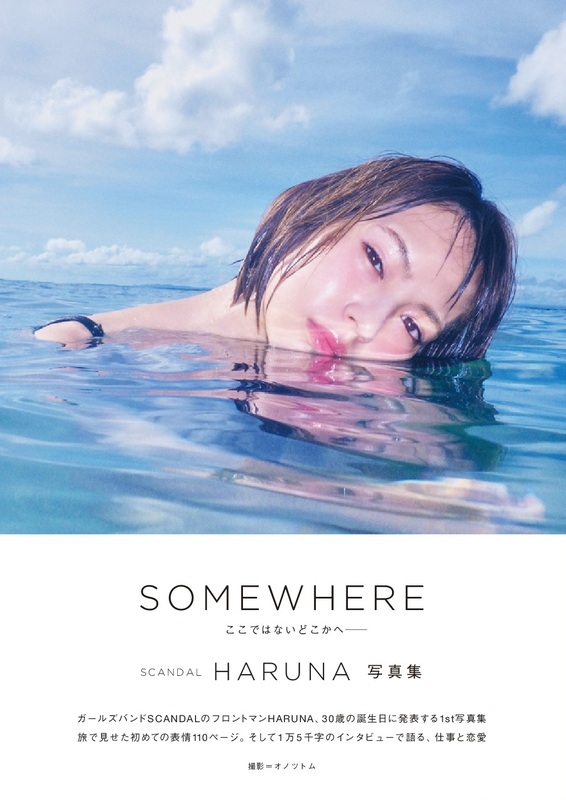 The book includes a long interview covering the self-confidence Haruna has acquired as being part of the band, her determination to never feel down when she’s frustrated, her forward-facing gaze in any situation, her girly smile, the band, work, love and more. Pre-orders sold out the moment the book went up for sale, so additional prints are in the works. The number of people wanting to attend the release events in Tokyo and Osaka also far exceeds the scheduled amount. It’s clear to see the fans’ love and support for Haruna. Before the event at HMV&BOOKS on August 18 began, 16 media companies were sat in attendance. Haruna confessed that she was nervous being surrounded by reporters for something other than music. “I’m a little relieved. Additional prints are being prepared for pre-orders. 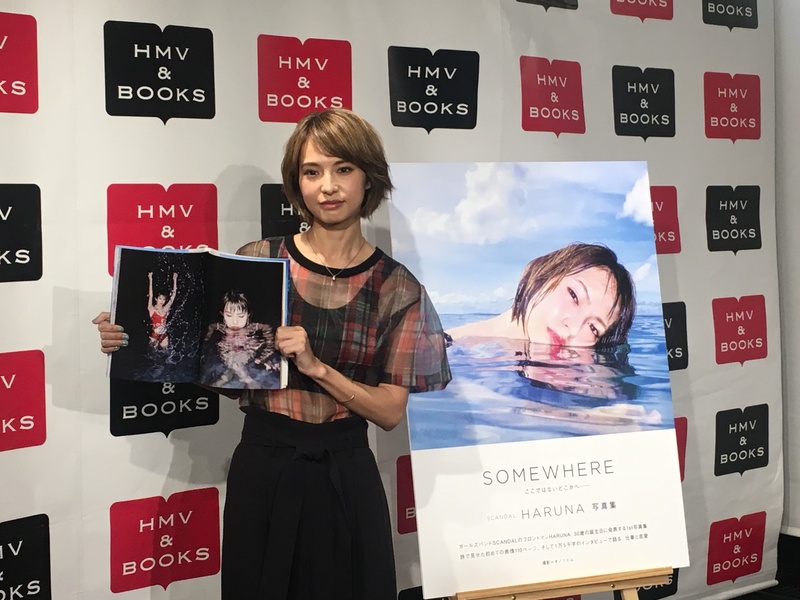 I was overjoyed at seeing all my fans kindly puchasing the book before my eyes,” Haruna expressed in regards to releasing a photo book. I was even more nervous than I thought I would be [laughs]. The angle of the questions and the feeling of distance felt completely different than during the CD release. I think it was a very good experience. So many people kindly came to the event. There were people who had already bought and looked at the book. There was event a woman the same age as me who said, “Let’s do our best in our 30s.” I was also so happy to hear someone say, “I became even more of a fan after reading the book.” I talk a bit more personally than I show at concerts in the interview in the book, so I’m glad I put it out even if it’s that part of myself I included that made people like me. ――What are your thoughts on releasing your first photo book? I’m a little relieved. It was my first time releasing something by myself other than music so I wasn’t able to picture how many people would read it, but I was so happy at there being reprints made for pre-orders and seeing people buy it in front of me after it was released. ――What made you want to release a photo book? My manager had spoken to me about it, but during that time I said to him, “I’m already going to be 30 soon.” He said, “You look like you’re having fun even when performing. You’re shining. I think the Haruna you are right now is amazing.” So I gained a bit more confidence and reached a decision to release the book. ――How was it shooting on Cebu Island? It was a tight schedule, just 2 days, but it was a lot of fun. The thing I remember the most is on the page at the end of the book. There’s a photo with the setting sun behind me. The colour of it changed ever so rapidly. It was such a dramatic sight and left an impression on me. I’ll never forget that shoot. ――Which is your favourite photo? It wasn’t that one. The one I really like is the one we took in the pool at night. It was my first time having a photo taken of my whole body while wearing a swimsuit. I had absolutely no idea how the photo would turn out because there weren’t any lights at the pool. I never thought it would look so striking. I think it’s really mysterious how it took so well, even the water. I’m very satisfied we were able to take an artistic photo. ――How did the other members react? ――What do you think about expressing yourself in the photos? Honestly, I thought people would express doubt about a band member putting out photos, but we’re a band that has come to have self confidence in breaking down things with certain meanings, like “You’re band so you can’t do this and that” and “You’re a band so you should be like this.” So I upheld my confidence in some way that a band vocalist can put out a photo book. I feel like right now is the most fun time in my life, so I hope that people can see that simply. ――Did you have any resistance to the swimsuit photoshoot? I went to the gym and trained my body for it, so I was able to have more fun than be against it. Even when the photos were taken I learned that I like having my photo taken, so it was a good discovery. ――Will the photo book release tie in with anything in the future? I feel like there won’t be anything too scary. ――What do you rate the photo book? Is it okay to give it a full score? It’s 10/10. I ship it with confidence. ――What are your aspirations turning 30? Even after having turned 30 my goal hasn’t changed, I will remain active musically. I am to continue music after marrying and having kids. I think I would like to do both of those things before I’m 35. ――What do you want to challenge yourself to outside of music? I’ve grown to like travelling in recent years. I’ve been on trips even on my own. I like things like that. I’m not like Another Sky though [laughs]. I’d like to do a travel show like that. ――One last time, please tell us your outlook for the future. I think it’s somewhat a miracle that SCANDAL has continued for 10 years. I think it’s extraordinary for four girls to do music for 10 years. There’s a lot of bands who split up in that time frame, so I have confidence in having come along 10 years. My outlook for the future is for us four to go as far as we can together. Haruna’s photo book SOMEWHERE has many people hooked right now. Be sure to pick up a copy for yourself if you’re interested!